The 2011 Chevy Cruze, already selling in Europe, comes to the U.S. this week at the Los Angeles Auto Show to challenge Honda Civic and Toyota Corolla with more spacious interior and greater cargo room, according to General Motors. The 2011 Chevrolet Cruze will be offered in LS, LT and LTZ trims and a new family of small-displacement engines, including 138 horsepower Ecotec 1.4L I-4 turbo which is standard on LT and LTZ models. Along with ten standard air bags, the Cruze should rank high in fuel economy and safety. A stereo system that includes MP3 playback capability, six speakers and an auxiliary jack for personal playback devices is standard. "Cruze is already a hit across Europe and Asia; and now, it's coming to America to challenge the status quo," said Brent Dewar, GM Vice President, Chevrolet Global brand. "Along with the Volt electric vehicle, Cruze is the latest tangible example of how Chevrolet is working on exciting products that range from gas-friendly to gas-free." More from the L.A. Show. Ten concepts are listed for display at the Los Angeles Auto Show that starts next week. Most of them were at the Frankfurt Auto Show two and a half months ago. 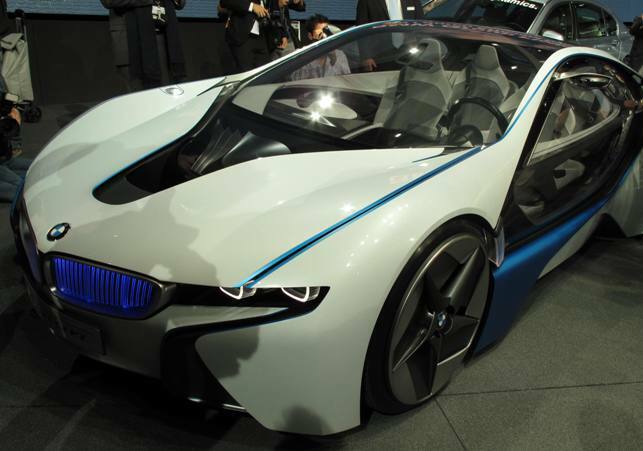 The most interesting just may be the BMW Vision EfficientDynamics (pictured above at the Frankfurt Auto Show). It attracted big crowds in Germany. Seven world debuts are listed for the Los Angeles Auto Show media days next week. Cadillac CTS Coupe, Dodge Viper, Honda Personal-Neo Urban Transport, Porsche Boxster Spyder, Toyota Sienna and two Volkswagens. We've had stories on two of them - Porsche Boxster Spyder and the Cadillac CTS Coupe. The Los Angeles Auto Show website shows at least 30 North American debuts, including the ten concepts, many were on display in Frankfurt two months ago like the Kia Sorento and Hyundai Tucson (pictured above as the ix35) to name two. The Buick Regal, Chevy Cruze, Mazda2, Kia Sorento, Hyundai Tucson and two VW's could all be good volume vehicles. L.A. is important to the luxury car makers, especially Audi, BMW, Mercedes-Benz, Porsche and Volvo which each have multiple debut vehicles. Standby for a really big show from the car-centric home of Hollywood. 2010 Lexus LS 600h L For $109,675 MSRP - wow! The enhanced 2010 LS 600h L premium luxury hybrid sedan will arrive at dealerships later this month and sell for $109,675 (including delivery, processing and handling fee of $875). The “L” signifying the long-wheelbase LS platform. The LS 600h L hybrid powertrain system combines a 5.0-liter V8 gasoline engine with two powerful electric motors and a large-capacity battery pack. The hybrid powertrain generates a peak combined output rating of 438 horsepower and accelerates from zero-to-60 mph in 5.5 seconds. The 2010 model has such features as standard Intuitive Park Assist with Advance Parking Guidance and Intelligent High-Beam, a driver's seat with auto slide-away that makes ingress/egress more comfortable, rear power sunshade, an LCD instrument cluster, Lexus Navigation system with casual language recognition, Bluetooth phonebook download capability and music playing capability with USB/iPod connectivity and Bluetooth audio streaming. The Premium Package II includes butterfly rear headrest and left rear seat with lumbar massage and the Executive Class Seating Package II adds power rear driver's side seat and ottoman with lumbar massage. Lexus Enform with Safety Connect is standard on all LS 600h L. Complimentary one-year trial subscriptions of Lexus Enform with Safety Connect are included on all purchases of new LS 600h L. The Lexus Enform and the Safety Connect response center operates 24 hours a day, 7 days a week - every day of the year. Price increases on other select Lexus models range from $300 for the IS 250 and IS 350 to $900 for the GS 450h and SC 430 will become effective with vehicles produced on December, 2009. 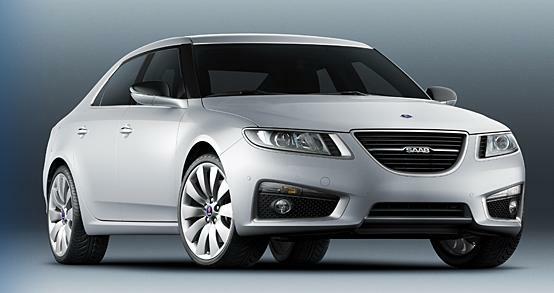 Saab Story - Buyer Pulls Out: Saturn Deja Vu? General Motors confirmed today that the proposed sale of its Saab subsidiary to Koenigsegg Group AB was terminated at the discretion of the buyer. "We're obviously very disappointed with the decision to pull out of the Saab purchase," said GM President and CEO, Fritz Henderson. "Many have worked tirelessly over the past several months to create a sustainable plan for the future of Saab by selling the brand and its manufacturing interests to Koenigsegg Group AB. Given the sudden change in direction, we will take the next several days to assess the situation and will advise on the next steps next week." The all-new, second generation 2010 Lexus GX 460 luxury utility vehicle with a new 301 horsepower 4.6-liter V8 engine producing 329 lb-ft of peak torque will be on display for the first time at the Los Angeles Auto Show next week. The GX 460 will be offered in two grades: base, which will carry an MSRP of $51,970, and Premium which will be priced at $56,765 plus a delivery, processing and handling fee of $875. A six-speed automatic transmission with sequential shift delivers combined city/highway fuel economy of an EPA-estimated 17 mpg broken down as an EPA-estimated 15 mpg city and 20 mpg highway. The second row seat slides 4.1 inches fore/aft and the foldable and reclining second row seats feature a 60/40 walk-in function to access the standard power fold-flat third row seats. Standard features include heated and ventilated front seats, 10 airbags, rear back-up camera (without Navigation), Kinetic Dynamic Suspension System which can reduce maximum body-roll angle by as much as 50 percent to help enhance both on-road handling response and off-highway capability and full-time four-wheel drive. Safety features available include the Pre-Collision System, wide-view front and side cameras, Lane Departure Alert and Intelligent High Beam. I saw the GX in Frankfurt where it was on display as a Toyota Land Cruiser for the European market. The GX 460 will be in U.S. showrooms in late December. The 2011 Cadillac CTS Coupe unveiled today comes with a 304 horsepower direct injected 3.6-liter V-6 engine which runs on regular unleaded gasoline with an EPA-estimated fuel economy of 27 mpg on the highway. There are two transmission options: the standard six-speed manual, featuring a revised clutch and dual-mass flywheel and optional 6-speed automatic transmission with Driver Shift Control (and available steering wheel mounted shift buttons). There is a rear-wheel or all-wheel drive option. The CTS Coupe's design carries over virtually unchanged from the concept car that was introduced at the North American International Auto Show in Detroit in 2008. The coupe has the same wheelbase as the CTS sedan and is approximately two inches lower and two inches shorter and shares the same instrument panel, console, headlamps, front fenders and grille as the four door version. Some high tech features include touch-pad controlled doors which removes the need for conventional door handles and a 40-gig hard drive, including the ability to store music and pause-and-replay live radio. Two suspension-tuning levels are available: a Performance Package with 18-inch wheels and all-season tires (available in both RWD and AWD,) and the Summer Tire Performance Package, with 19-inch tires and wheels and a higher level of road holding capability. StabiliTrak, the advanced electronic chassis control system, is standard. The 2011 CTS Coupe will be in Cadillac showrooms in the spring of 2010. On September 10, 2009, General Motors announced that it will offer a Satisfaction Guarantee to eligible buyers of new Chevrolet, Buick, GMC and Cadillac vehicles. The program started Sept. 14. The guarantee allows customers to return their vehicle to their dealer between 31 and 60 days of purchase and receive a refund of the purchase price for the vehicle. That should be plenty of time to evaluate the vehicle, afterall an elite number of journalists usually get a week behind the wheel to generate a vehicle review that may or may not effect the purchase process. This past Thursday on Nov. 18, or 65 days after the offer started, General Motors issued a press release saying that 653 customers to date have taken the 60-day Money Back Guarantee return in lieu of a $500 discount on a new vehicle purchase. 53 vehicles have been returned and about 140 others are in the process. In October, GM sold 177,603 vehicles so the 193 returns is barely a rounding error. One of the criteria is that customers must take delivery by Nov. 30th, so by early February we should have a good idea of how many people rejected their GM vehicle for whatever reason and returned it. GM says that "every potential walk away is getting an exit interview from (Vice President of Global Product Engineering Mark) Reuss or one of his engineering leadership team." Now hopefully they'll survey the other 1.7 million plus customers who bought GM vehicles this year and owned them longer than 60 days to get better info on their products. If GM needs help, I have the answer, so send me an email or post a comment. 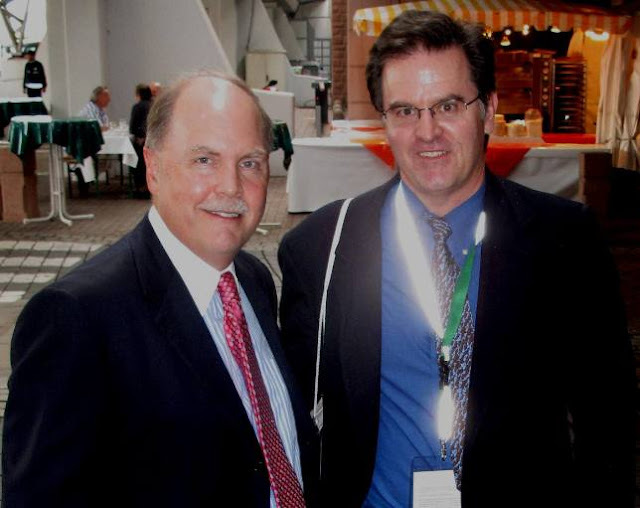 Frederick (Fritz) Henderson , president and chief executive officer of General Motors - (pictured left at 2009 Frankfurt Auto Show) will kick off the Los Angeles Auto Show by delivering the Motor Press Guild (MPG) keynote address the morning of Dec. 2, 2009. Henderson was elected GM president and chief executive officer in March 2009. Prior to that, he had been GM president and chief operating officer since March 2008. He was vice chairman and chief financial officer from January 2006 to March 2008. Henderson started his career at GM as a senior analyst in 1984 and was promoted to several positions of increasing responsibility before becoming GMAC group vice president of finance in Detroit in 1992. He went on to serve as president of GM Latin America, Africa and Middle East, president of GM Asia Pacific, and chairman of GM Europe. Sergio Marchionne, Chief Executive Officer of Chrysler Group LLC - (in a Frankfurt Auto Show media frenzy) will address the Economic Club of Chicago at the group's annual Chicago Auto Show luncheon meeting on Feb. 11, 2010. 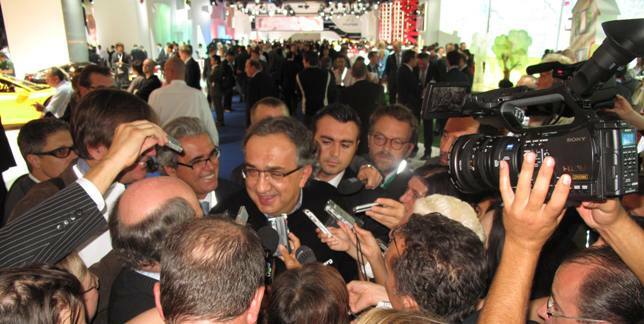 Sergio Marchionne serves as Chief Executive Officer of Fiat S.p.A., Turin, and Fiat Group Automobiles. He has been a member of the supervisory board of Fiat S.p.A. since 2003 and has served as CEO of the company since June 2004. He is also a member of Acea (European Automobile Manufacturers Association). Are vehicle prices going up or down? Edmunds.com has created True Market Value® Predicted Price Trends for most models over the next 30-days from the date the information is posted. 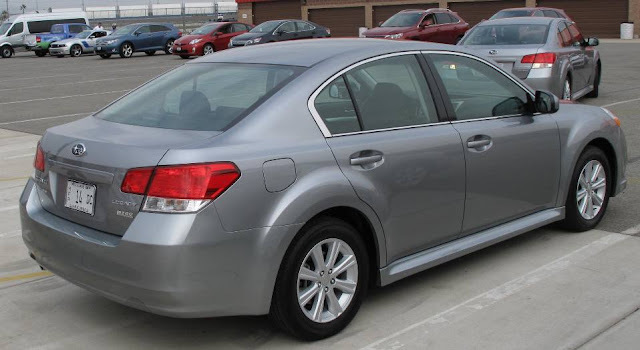 The November 16, 2009 posting shows just four vehicles expected to increase in price: 2010 Acura RL, 2010 BMW M5, 2010 Porsche 911 and 2010 Volvo XC60. The rest of the vehicles on the current Edmunds.com list will see a flat or declining price. 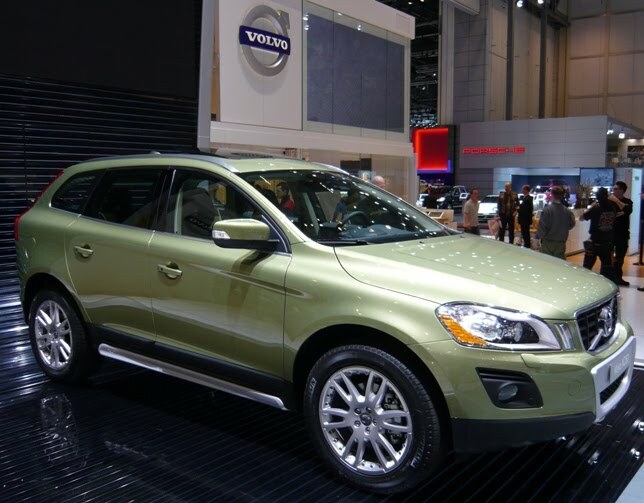 The Volvo XC60 (pictured at the 2008 Geneva Auto Show) is the only vehicle that gets a big fat up arrow which translates to big increase (2% or greater). (Volvo's union workers are meeting today regarding Ford's sale of Volvo to Geely of China.) I recently drove the XC60 and found the Lane Departure Warning an interesting feature along with Collision Warning with Auto Brake. The Volvo website has the XC60 starting at $32,995 MSRP. inventory level history, days-to-turn history, current and historical consideration intent among shoppers on Edmunds.com, prior incentives, past retail unit sales, historical Edmunds.com True Market Value® prices, current actual transaction prices, brand pricing and incentive patterns, scheduled launches of new or revised competitive products and macroeconomic factors that affect the overall market. Nineteen cars and eight SUVs earn the Insurance Institute for Highway Safety's Top Safety Pick award for 2010. For the first time, good performance in a roof strength test to measure protection in a rollover is required to win. Top Safety Pick recognizes vehicles that do the best job of protecting people in front, side, rear, and now rollover crashes based on good ratings in Institute tests. Winners also must have electronic stability control. Ford and its Volvo subsidiary have six winners: Ford Taurus, Lincoln MKS, Volvo S80, C30, XC60 and XC90. Subaru, the only manufacturer with a winner in all four vehicle classes in which it competes, took five awards: Impreza, Legacy, Outback, Forester and Tribeca all earn Top Safety Pick. Volkswagen/Audi has five: Audi A3, VW Jetta, Passat, Golf and Tiguan. Chrysler earns four awards: Chrysler Sebring four-door with optional electronic stability control, Dodge Avenger with optional electronic stability control, Dodge Journey and Jeep Patriot with optional side torso airbags. Honda had two: the Civic 4-door models (except Si) with optional electronic stability control and the Honda Element. GM had two: Buick LaCrosse and Chevrolet Malibu built after October 2009. Two new small cars, the Nissan Cube and Kia Soul, join the Top Safety Pick list for 2010 making three boxy-style vehicles earning the distinction Mercedes-Benz C Class sedan was also among the 27 qualifiers. Toyota and its Lexus and Scion subsidiaries had a strong showing in 2009 with 11 winners but were shut out for 2010. Four other manufacturers whose vehicles have earned Top Safety Pick in the past didn't have a qualifying vehicle for 2010: BMW, Mazda, Mitsubishi, and Saab. The hot-selling Honda Accord and Ford Fusion didn't earn the required good roof strength rating to qualify while the Toyota Camry's seats and head restraints are rated marginal for protection against whiplash injury. 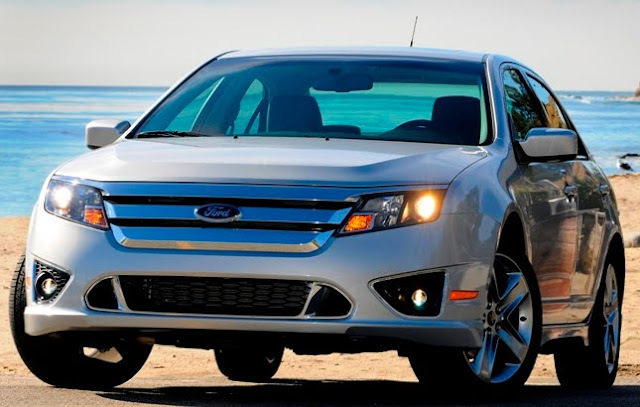 Motor Trend Magazine named the 2010 Ford Fusion as their pick for Car of the Year award saying: "Today, the 2010 Ford Fusion's impressive bandwidth as a model range was one of the many factors that helped it earn the 2010 Motor Trend Car of the Year award." Motor Trend's Executive Editor Matt Stone goes on to write: "Want an economical midsize sedan that doesn't cost much, yet won't bore you to tears? Need to please your greener side with a high-tech hybrid? Fancy a near-sport sedan with AWD, 18-inch rolling stock, and the latest infotainment and electronics? Depending on which model you choose and how many option boxes you tick, the Fusion can be any of the above." The 2010 Fusion bested a field of 23 contenders — including the Toyota Camry, Honda Accord, BMW-7 series and Mercedes-Benz E Class. The 2011 MAZDA2 will make its North American debut at the 2009 Los Angeles Auto Show December 2nd and will be sold in the U.S. and Canada beginning in late 2010. MAZDA2 has been a sales and media success in markets around the world, winning 48 awards and being recognized as Car of the Year in more than 20 countries. 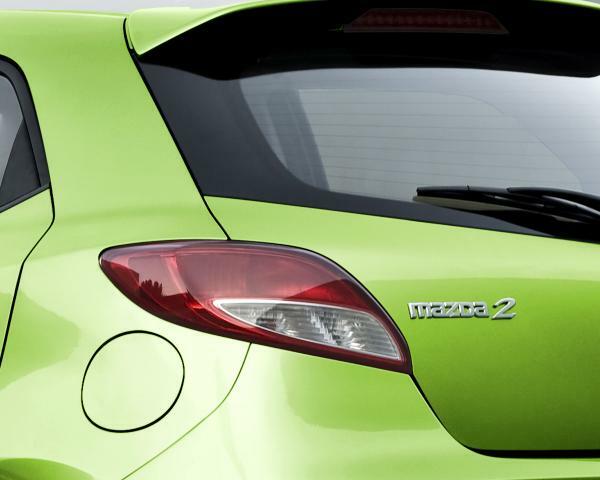 Additionally, MAZDA2 was named "2008 World Car of the Year," besting all other new cars around the world. Looks like manufacturers are trending small for the traditionally larger vehicle U.S. market. This is deja vu all over again. How many times do we have to see these vehicles in pre-launch hype before we actually see them on U.S. streets? Here we go again. GM skipped staging a media conference at the Los Angeles Auto Show last year apparently because of budget issues - bad decision. Hello, this is one of the biggest car markets in the world - GM ignores it, then comes back bragging about already-seen vehicles, come on. A lot of media were ticked at the clapping and cheering crowd of GM employees in January at the Detroit Auto Show. Hey, media days at the large auto shows are for media to make objective criticism of new vehicles. Chevy vice president, Brent Dewar, will want to make his mark so he'll have make the most of what he's been dealt - Cruze and Volt are among them. Not his fault that his predecessors decided to have the longest vehicle lead time ever and then skip one of the most important auto shows in one of the biggest car buying markets. 2011 Chevrolet Cruze (pictured on right above) U.S. production version that includes a 1.4-liter turbo engine will debut at the Los Angeles Auto Show, on Dec. 2 after already launching in Europe and Asia. You'll have to wait until the third quarter of 2010 to see Cruze in a U.S. showroom. 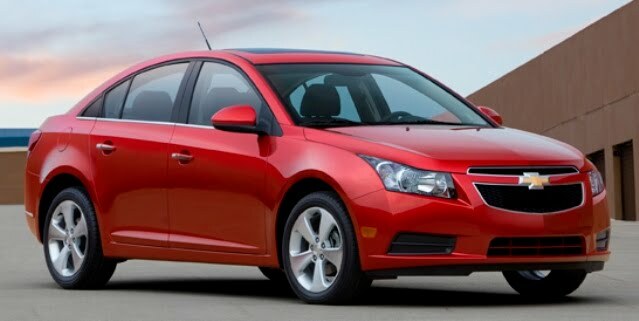 "With expected highway fuel economy up to 40 miles per gallon, Cruze will be extremely gas friendly," said Dewar. Let's hope GM gets a little more Southern Cal friendly. GM will be putting on the Fritz, that's Fritz Henderson, CEO of General Motors, keynote speaker December 2nd to kick off Media Days at the L.A. show. Let's see if he has anything new to say. 2011 Chevrolet Volt electric vehicle (picture on left above) is expected to drive up to 40 miles on electricity using a lithium-ion battery. When the Volt is depleted of energy, an engine/generator operates to extend the total driving range to more than 300 miles before refueling. Chevrolet will announce plans for initial retail markets where the Volt will be sold. 2010 Nissan cube hit showrooms in May and so far 16,849 have been sold through the end of October, including 2,097 last month which makes a statement about the cube appeal. The cube outsold the Kia Soul by 34 units and easily eclipsed the Scion xD which had October sales of 1,023 and Scion xB at 1,782. The Honda Element, another member of the boxy trend, saw just 871 leave showrooms last month. The front-wheel drive cube is built on Nissan’s B-platform with a standard 122-horsepower 1.8-liter DOHC 4-cylinder engine and a choice of Nissan’s advanced, smooth shifting Xtronic CVT (Continuously Variable Transmission) or 6-speed manual transmission. My first impression was the amazing visability with its large windows and all of the power windows fully opened. Then once behind the wheel, I found the low-end torque provided plenty of quickness and the engine delivered ample power to make the cube fun-to-drive. Getting 29 miles-per-gallon is a nice bonus. cube is offered in four models: cube 1.8, cube starting at $13,990, 1.8 S starting at $14,690, cube 1.8 SL starting at $16,790 and a specialty vehicle edition, the cube 1.8 Krōm starting at $19,370 (pictured above). Nissan offers a completely differently designed vehicle for a racing enthusiast with deeper pockets - the all-new, second generation NISMO Z, went on sale in June with its 350 horsepower 3.7-liter DOHC V6 engine that delivers 276 lb-ft of torque and has a starting price tag of $39,130. 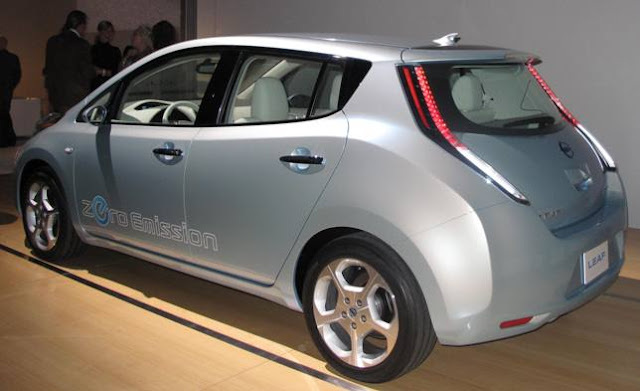 The Nissan Leaf all-electric five-passenger, five-door, gasoline-free car made its North American debut in Los Angeles on Friday November 13th at Dodger Stadium during the day and at a media bash in Santa Monica at night. The Nissan LEAF Zero Emission North American Tour goes from L.A. to the San Francisco Auto Show that starts November 26th, making stops in 22 cities, in 11 states, the District of Columbia, and Vancouver, Canada. The in-house developed electric motor delivers 80kW/280Nm for high response and powerful acceleration. The 24kWh laminated compact lithium-ion battery pack is placed under the vehicle floor without compromising cabin or cargo space. The regenerative brake system is employed to recharge the battery during deceleration and braking extends the driving range to more than 160km or about 100 miles under a full charge under average, everyday driving conditions. Top speed is 90 miles an hour. 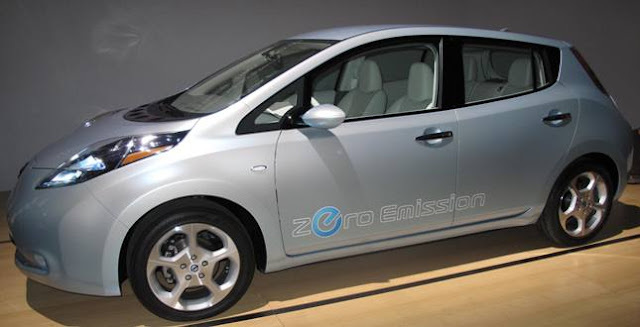 Nissan North America will begin taking reservations for LEAF in spring 2010 with the launch expected in late 2010 in Japan, the United States, and Europe. Hyundai was awarded Advertising Age Marketer of the Year, winning the trade magazine's reader poll by beating out household names like Walmart, McDonald's, Lego and Amazon. Around the Super Bowl Hyundai promoted the Genesis, voted North American Car of the Year, by taking shots at their German and Japanese rivals and launched the new Genesis Coupe. Commercials for the Hyundai Assurance program, which let buyers return their new vehicles for up to a year if they lost their jobs, also helped Hyundai establish brand identity. During the Academy Awards Hyundai ran spots in slots that were given up by troubled GM. Hyundai has just launched a billboard campaign at Times Square in New York. All Hyundai's aggressive marketing has paid off as October sales of 31,005 was a 49 percent increase compared with October 2008. Calendar year-to-date, Hyundai sales are up 4 percent and market share is up 1.2 percentage points (from 3.1 percent to 4.3 percent). Expected to give Hyundai a year end sales boost will be the all-new Tuscon ix. The Hyundai Tucson ix was first announced on Aug. 25 in Korea as the Hyundai ix35 and had its world debut in mid-September at the Frankfurt Auto Show where I took the above photo. The Tucson ix will be on display in early December at the Los Angeles Auto Show with more details on its features and specs. Tucson ix rides on a 104 inch wheelbase which is a fraction of an inch longer than the previous iteration. At 173.6 inches long and 71.6 inches wide, it is also longer and wider than its predecessor improving the interior cabin space. Overall height has been lowered without affecting headroom. Tucson ix will get the newest fuel-efficient engines and six-speed manual and automatic transmissions. For the North American market, a choice of 2-liter or 2.4-liter Theta-II engines will be available. Honda CRV, the eighth best-selling vehicle overall in 2009, leads the SUV/CUV sales race in 2009 with 158,573 sold through October, down 7.4 percent from the same ten months in 2008 but that's because the competition is heating up as SUV shoppers crossover and more entries arrive to carve up the sales pie. Ford Escape, which Ford calls a CUV (Crossover Utility Vehicle), has sales of 138,739 in 2009, up 2.3 percent from 2008, putting it in eleventh spot in overall sales, trailing CRV by less than 20,000 units in the race. Toyota Rav4 rounds out the top three with sales of 120,834 so far this year is a gain of 1.6 percent over 2008. GM's Chevrolet Traverse, new to the market this year, has sold 75,156 in 2009. Toyota's Lexus RX350 sales are at 73,641, a 7.7 percent rise from 2008. Ford Edge sales are 72,624, a drop of 27.2 percent. Chrysler's Jeep Wrangler sales of 70,350, is just a 2 percent drop from 2008. Toyota Highlander sales this year are 67,463, down 24.2 percent from last year. Subaru Forester sales are 65,610, up 33 percent from the same period a year ago. Nissan Rogue sales are 65,570, up 8.1 percent over last year. Hyundai Santa Fe sales are 64,515, up 6.8 percent from last year. GM's Chevrolet Equinox sales are 63,850, up 8 percent from last year. GM's Chevrolet Tahoe sales are 57,443, a 29.1 percent decline. Toyota Venza, another new entry, has sales of 44,451 this year. GM's GMC Acadia sales are 43,957, a decrease of 26.8 percent from 2008. Chrysler's Jeep Grand Cherokee sales are 43,146 this year, down 31 percent from 2008. Nissan Murano sales are 43,120, a drop of 29.1 percent from 2008. Dodge Journey sales are 41,520 in 2009, up 4 percent over last year when it came to market. Ford Explorer, the one-time dominant SUV leader, has sales of 41,138 this year, a 39.8 percent decline from 2008. Kia Sportage sales are at 40,042, a 37 percent jump from a year ago, just crossing the 40,000 threshold through the end of October 2009. 1. Ford F-Series pick-up trucks lead sales with 334,922 sold through the end of October, down 23.2 percent from the same period in 2008. 2. Toyota Camry with sales of 294,493 this year, 23.7 percent less than last year at the same time, is second. 3. Honda Accord is third with sales of 244,579, a 26.6 percent drop from 2008. 4. Toyota Corolla is fourth at 240,755 sold, a decline of 21.6 percent. 5. General Motors Chevrolet Silverado pick-up trucks are in fifth place with 229,388 sold in 2009, down 38.1 percent from 2008. 6. Honda Civic sales are sixth with sales of 223,751, a 26.5 percent fall from last year. 7. Nissan Altima in seventh place with a sales count of 169,435, a 29.8 percent slide from the same ten months last year. 8. Honda CRV sales continue to be strong and lead the SUV segment with sales of 158,573, down 7.4 percent from 2008 for an eighth place ranking so far in 2009. The CRV is the 3rd Honda in the top 10. 9. Chrysler's Dodge Ram pick-up trucks in ninth place has sales of 155,467, a drop of 27 percent from 2008. 10. Ford Fusion comes in at tenth with sales of 148,045, an increase of 15.3 percent over 2008. Fusion is the only top 10 seller to post a rise in sales over last year. The new 2011 Porsche Boxster Spyder mid-engined roadster will be the lightest Porsche available at 2,811 pounds. The Boxster Spyder features a 3.4-liter six-cylinder engine with Direct Fuel Injection upfront of the rear axle. Maximum output is 320 horsepower, 10 hp more than the Boxster S.
The Boxster Spyder features a 3.4-liter six-cylinder engine with Direct Fuel Injection upfront of the rear axle. Maximum output is 320 horsepower, 10 horsepower more than the Boxster S. When equipped with Porsche-Doppelkupplung (PDK) transmission and the Sports Chrono Package, the new Spyder, using Launch Control, accelerates from a standstill to 60 mph in 4.6 seconds. Top track speed is 166 mph - with the roof open. This third Boxster model will join the Boxster and Boxster S and will make its world debut at the Los Angeles Auto Show, December 2, 2009. The 2011 Boxster Spyder goes on sale February 2010. U.S. pricing is $61,200. The all-new 2010 Suzuki Kizashi sedan (pronounced "Kee-Zah-Shee") will start at $18,999 (plus $735 for destination and handling) for the entry level Kizashi S model with a 185 horsepower 2.4-liter 4 Cylinder, 16-valve, DOHC engine mated to a six-speed manual transmission. The automatic CVT transmission version starts at $20,499. Standard features of the Kizashi S include 8 airbags (front/rear side and curtain), pushbutton keyless start, dual-zone climate control, 9-speaker audio with steering controls, EPS Stability Control and ABS, projector beam headlamps and power windows, doors and mirrors. Suzuki also offers the Kizashi SE, GTS, SLS trims which, along with the S are available in both two-wheel and all-wheel drive. 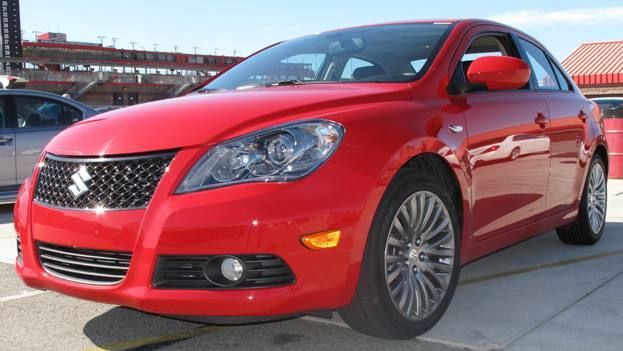 The all-new 2010 Suzuki Kizashi will debut in dealer showrooms in December 2009. General Motors U.S. October sales of 177,603 vehicles, was up 4 percent from last October, GM's first year-over-year gain since January 2008. Total sales increased 13 percent when compared with September. Year-to-date GM has sold 1,724,554 vehicles, down 33.8 percent from the first ten months of 2008. The Chevrolet nameplate accounted for 65.5% of GM's October sales and 74.8% of GM's 2009 sales led by the Silverado pickup truck and Impala and Malibu cars. Toyota Motor Sales reported October sales of 152,165 vehicles, a decrease of 3.5 percent from last October. The Toyota Division posted October sales of 132,663 units, a decrease of 5.8 percent from the same period last year. The Lexus Division reported October sales of 19,502 units, an increase of 15.5 percent over the year-ago month. Year-to-date Toyota sales are 1,448,589, down 25.5 percent from 2008. Ford, Lincoln and Mercury October U.S. sales totaled 132,483, up 3 percent versus a year ago and 21 percent higher than September. This marks the third time in the last four months Ford sales have increased. Ford sales so far in 2009 are 1,323,335, a drop of 20.4 percent from the first ten months in 2008. Volvo, still owned by Ford, had sales of 4,437, up 19.4 percent from October 2008, bringing the year-to-date sales total to 51,166, a 19.7 percent drop from the first ten months of 2008. American Honda posted total October vehicle sales of 85,502, a decline of 4 percent compared to October 2008. Honda Division posted October sales of 75,751, a decline of five units versus October 2008. American Honda year-to-date sales of 969,638 representing a 23.4 percent decrease. Chrysler Group reported total U.S. sales for October of 65,803 units, a decrease of 30 percent compared with the same time period in 2008. Year-to-date Chrysler sales are 781,319, 39 percent lower than the first ten months last year. Nissan North America reported October 2009 sales of 60,115, an increase of 5.6 percent compared with October 2008. Nissan Division sales rose 7.7 percent for the month, while sales of Infiniti vehicles were 9.3 percent lower than a year ago. Nissan has sold 640,411 vehicles this year, a 24 percent decline from last year. Hyundai Motor America October sales of 31,005 units, a 49 percent increase compared with October 2008. Calendar year-to-date, Hyundai sales are 373,222, up 4 percent from 2008. This marks the tenth consecutive month of year-over-year gains in retail market share. Kia Motors America October sales of 22,490 units, a 45.3-percent increase over the same month last year. Year to date sales totaled 261,060, a 7.2-percent increase over the same period last year. Volkswagen of America reported October 2009 sales of 17,037, a 7.2 percent increase over October 2008. Audi, which is owned by VW but reports separately, had U.S. October sales of 7,358, down just 1.1 percent from October 2008's all-time record. VW 2009 sales are 176,817 so far this year, down 7.5 percent from 2008 while Audi has sold 66,876 vehicles in 2009 down 8.7 percent from 2008. The BMW Group in the U.S. (BMW and MINI combined) reported October sales of 20,619 vehicles, a decrease of 19.1 percent the same month of 2008. The BMW Group also reported a year-to-date sales volume of 199,838 vehicles, down 23.7 percent compared to the first ten months of last year. Daimler AG reported sales for the Mercedes-Benz Cars division in the U.S. (Mercedes-Benz and smart combined) of 18,854 units, an increase of 9.4 percent compared to October 2008. Mercedes-Benz USA October sales of 18,193 vehicles was its highest month of the year and a 21.3% improvement over October 2008. On a year-to-date basis, Mercedes sold 153,606 new vehicles, trailing the comparable period last year by 20.1%. smart USA recorded 661 sales in October 2009, a 70.4 percent drop. Year-to-date sales now total 13,082 units, down 35.8 percent from 2008. Since its introduction in the United States, there are nearly 40,000 smart fortwos traveling the roads throughout America. Subaru of America had record-breaking October sales of 18,169, a 41-percent gain over October 2008. 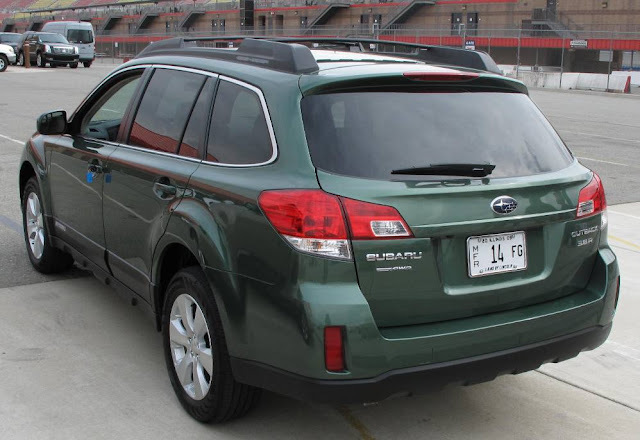 Subaru had a 13-percent gain year-to-date with 176,590 units sold in 2009. Mazda North American Operations reported October 2009 sales of 15,068, a decrease of 8.4 percent versus October of 2008. Overall, total yearly sales are reported at 175,257, down 24.4 percent compared to 2008. Mitsubishi Motors North America October 2009 sales of 3,867 brings the 2009 total for 10 months to 46,706 vehicles. Land Rover October U.S. sales were 2,160, a 7 percent increase over October 2008 and year-to-date Land Rover has sold 20,545 vehicles, a drop of 18 percent. Jaguar sold 882 cars in October, a 2 percent gain over last year and in 2009 Jaguar has sales of 9,556, down 26 percent from the same ten months of 2008. Jaguar Land Rover, owned by Tata Motors of India, has sold a combined total of 30,101 in the U.S. this year down 21 percent from the year ago period. American Suzuki had sales of 1,745 in October, a 50 percent drop from a year ago. Year-to-date Suzuki has sold 35.270 vehicles, a 55 percent drop from the first ten months of 2008. Porsche Cars North America October sales in the U.S. were 1,642, up 15 percent from the same period last year. This marks the third consecutive month that PCNA has recorded an increase in year-over-year sales from 2008. On sale for only about two weeks, Porsche’s new four-door Panamera has already recorded sales of 360. Year-to-date Porsche sales are 15,952, down 29.1 percent from ten months in 2008. The all-new 2010 Honda Accord Crosstour is set to debut on November 20th with a manufacturer's suggested retail price (MSRP) starting at $29,670, plus a destination and handling charge of $710. The 271 horsepower Accord Crosstour is available in two model choices, the EX and EX-L getting an EPA-rated city/highway fuel economy of 18/27 mpg on 2WD models with Real Time 4WD drive is available. The Accord Crosstour Crossover Utility Vehicle is based on the Accord V-6 Sedan with added cargo space and compartments in the rear. 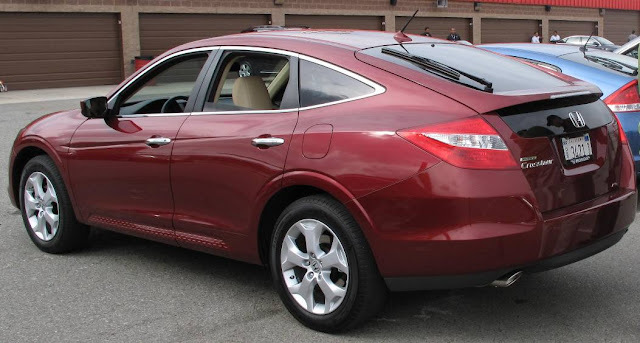 All Accord Crosstour models come standard with a 3.5-liter i-VTEC V-6 engine with Variable Cylinder Management (VCM). The VCM cylinder deactivation system is programmed to run on 3, 4 or 6 cylinders, based on current power requirements. A 5-speed automatic transmission is standard equipment. Standard features on the Accord Crosstour EX include: dual-zone automatic air conditioning with second row ventilation, 360-Watt AM/FM 6-disc audio system with seven speakers, easy fold-down 60-40 split rear seat back, 17-inch aluminum wheels with 225/65 R17 all-season tires, hidden removable utility box, cruise control, moonroof, auto up/down driver and front passenger side windows, rear privacy glass, steering wheel-integrated audio controls, compass and outside temperature indicator, projector beam headlights with auto-off, fog lights, chrome door handles, body-colored power side mirrors with defrost, and more. The Accord Crosstour EX-L adds or upgrades: leather-trimmed seating surfaces with heated front seats, leather steering wheel, leather gear shift knob, auto day/night dimming rearview mirror, 18-inch aluminum wheels with 225/60 R18 all-season tires, auto on/off headlights, memory driver-side seats, memory side mirrors with reverse tilting capability, cargo privacy cover, HomeLink transmitter, cargo privacy cover, Kevlar cone speakers, aluminum dome-type front tweeter speakers and a USB audio interface. Subaru, the only car company with year-over-year sales increases in 2008 over 2007 and so far this year over last, has two all-new re-designed models. The all-new Subaru Outback has five trim levels starting at $22,995 for the 2.5i with the 170-horsepower 2.5-liter SOHC SUBARU BOXER® engine up to $28,995 for the 3.6R Limited with the 256-horsepower 6-cylinder SUBARU BOXER® engine coupled with leather-trimmed upholstery and 440-watt 9-speaker harman/kardon® premium audio system. The all-new Subaru Legacy 2.5i starts at $19,995 up to the Legacy 3.6R Limited starting at $27,995. All six of Subaru's vehicle lines have Symmetrical All-Wheel Drive which gives it sales traction in the Northeast, Northwest and all snow belt areas. The Impreza, Impreza WRX, Forester and Tribeca all have attractive features along with trim and price levels for a wide range of car buyers. 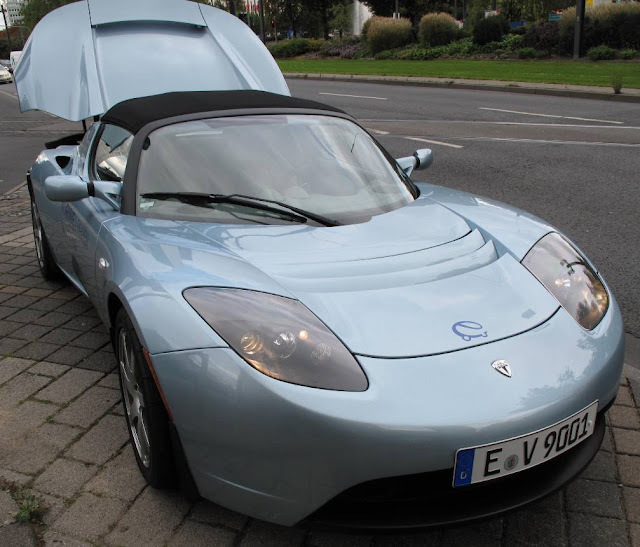 In mid-September at the Frankfurt Auto Show, the pure-electric Tesla Roadster was charged and ready to go with its 248 hp 3-phase electric motor with a 14,000 rev limit. Driving in normal conditions (mixed city and highway conditions in a range of temperatures) results in “real world” range of 244 miles per charge, though in Australia at the 10th annual Global Green Challenge a Tesla Roadster achieved 313 miles on a single charge. The Tesla Roadster has a base price of $109,000. 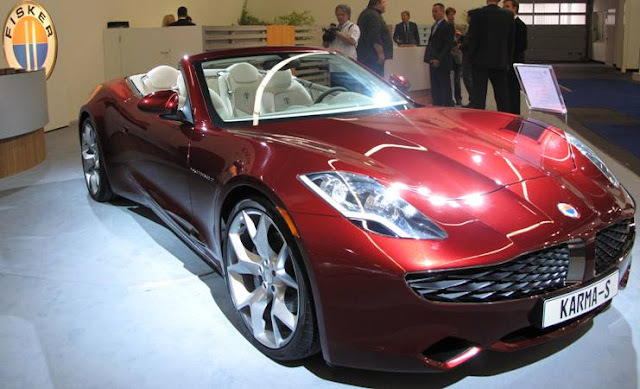 The Fisker Karma S is a four-seat, plug-in hybrid hardtop convertible. The deposit amount is $25,000.00 USD, with estimated delivery commencing at the end of 2011. Pricing for this model has not been finalized but is expected to be significantly higher than the current Fisker Karma model which is priced at $87,900. Fisker Automotive has selected the former GM Wilmington Assembly plant in Wilmington, Delaware, to build its $39,900 (after $7,500 in federal tax credits) family-oriented plug-in hybrid sedan. Production is scheduled to begin in late 2012 and create 2000 factory jobs and more than 3000 vendor/supplier jobs when production reaches full capacity in 2014. The Fisker Karma uses Q-DRIVE plug-in hybrid technology which means a fully-charged Karma burns no fuel for the first 50 miles before a gasoline engine kicks in to charge the lithium ion battery and the car operates as a normal hybrid vehicle. The Karma's 0-60 mph time is less than 6 seconds and has a top speed of 125 mph. Delivery of the $87,900, 100mpg Karma sedan will begin next year. A 0-60 mph time of 5.6 seconds, a top speed of 120mph with a range up to 300 miles and 45-minute QuickCharge time gives this electric sedan impressive stats plus its superior fuel cost features - you can charge it from any outlet, without ever stopping for gas. Tesla brags that the Model S has more cargo space than other sedans, is twice as efficient as hybrids and offers 100 percent torque, 100 percent of the time without jerky shifting and a fraction of the noise and harshness of internal combustion engines. 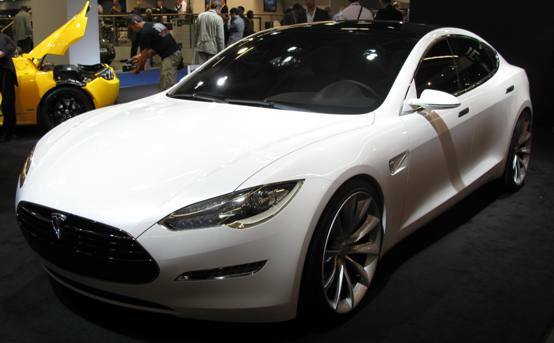 The Tesla Model S can carry five adults and two children and has a base price is $49,900. Deliveries start in 2011.